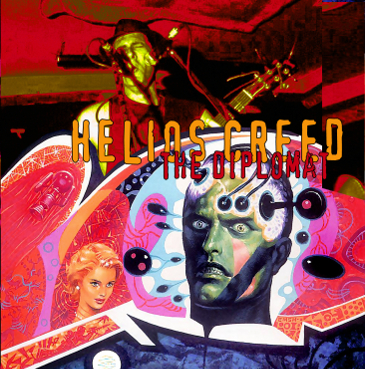 Another one of the blazing shows from the 1992 era live Helios Creed. 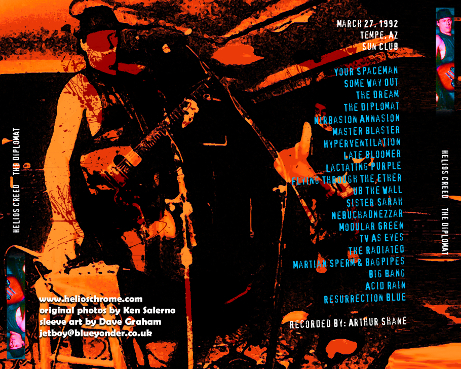 This is at the Sun Club in Arizona, you might remember the Sun Club 1990 bootleg vid and audio. The audio here is raw, but it's in your face, and intense. LOADS of heavy fuzzed out guitar, nice big setlist with most of the Lactating Purple album being played live. "Acid Rain" is introduced as new material - those lysergic melting acid-guitar leads from Helios. The levels are decent here - vocals are nice up-front for the majority of the duration of the show, the guitar thankfully is super raw and loud - the only thing I would recommend when listening to this is to turn up the bass a bit on your stereo receiver... have the treble leveled out at a neutral 0 level, but turn the bass up a tad to make up for it lacking a bit here... other than that - this is a nice RAW, blazing show from the 1992 live era. Enjoy! Be sure to dig the killer artwork that David Graham included - easy how-to instructions on printing the cd art are in the 2nd link below.